Lol@dee…yeah, well, these days that 2 cupcakes short kinda fits me..good catch though..
And polar kotex…you do NOT want to know what image that one cunjured up. Nope you sure dont! That Stella is so adorbs! As to potty pad training..such a great thing! I trained the puppy we gave to my mom years ago for that as mom is elderly, and she lived in maine..so it was a real need. Mom was able to train her for outdoors after winter.. poor little puppies will get Frostbitten pads in this weather. Always felt bad for our big dog buddy.but my then husband always put up a small sheltered area and snowblower him a path to it..we were told we spoiled him..but I always countered with how’d you like to have to do your business in the cold? Lol.. I still miss buddy…he was such a great dog, I could never get another after him..
Oh boy, just reread 1st comment. .lmbo! Dees gonna bust a gut. Wow, my phone really hates me. Moms, as to cupcake flavors. The two I need are the strawberry apple, and bannana apple.. wondering if those were the first 2 up.. If anyone has the Smoothie Moves Trophy from the mobile game (I think) I will give lots for it. <3 Looking for it for a friend. Moms, for some reason dh had decided Tylenol did not work for him. Not sure where he came up with that. Basically ER Dr. Agreed with my assessment. BUT, in dh defense..last year scared us both. It really was touch and go. So I do think he panicked a little. Understandable. But if he had listened to me, we wouldn’t have needed to go to ER..but because of the other meds he’s on, was safest thing to do..just for reassurance. Mist, are you looking for the car from the smooth moves? Or an actual trophy? The car was from smothy moves trophy challenge. GAGA, omg! Thank you so much for the bouncy castles! You didn’t have to do that, but thank you so much! Moms got the cupcakes! Thank you! Hopefully last day of extreme cold.. minus seven here without windchill..
balmy compared to other places but bitter cold none the less ! Really challenging to go out into that weather and get to work… Only had a couple of patients cancel due to the weather yesterday..
Hope you all are warm and well ! it’s going to be a little warmer today and much warmer this weekend! GOOD MORNING FELLOW GYMBO PEEPERS!!!! I want a WW day….me, my laptop, the bed, more estore points & NO INTERRUPTIONS! I honestly don’t think that will EVER happen… but a girl can dream. well, back to my crazy non stop life. ((((HUGS)))) to all! stay warm!!!! Hello everyone!! Just wanted to give a shout out to everyone living with extreme cold right now. I wish you warmth!!! -27 this morning, it’s warmed up to -11. This should be the last day of the bitter cold. Supposed to be 42 on Sat. It’s going to feel like a heat wave! Miss Stella must have some ancestral Alaskan wolf in her…she doesn’t give a flying fig about the cold. A couple of times I had to GO OUT and get her, or squeak one of her toys to get her inside. Moms, I thought the same thing about frostbite, I would warm up her paws in my hands after she came inside. There is some small frost build up on the inside of a few windows and a door that’s got a draft. But all in all, we stayed put and hasn’t been too bad. When you open the door, the cold air hits the warm air inside and it looks like ‘smoke’ rolling in. Dh and his work buddies did the thing where you take a mug of boiling water and throw it up in the air…it turns to solid ice/snow the second it hits the air. A few places in our city lost power for half a day. Crews had to work in this cold to restore power. So thankful that was not us. dee—grass in a box….totally thought of that SNL skit of ‘something’ else in a box! Kidding aside, I had no idea you could get that, how cool. Chant—I sometimes feel a few cupcakes short myself! That is the best phrase ever! Hope dh continues to improve. And I feel you…dh’s never listen. Ruby—Hope your dd is okay. Haven’t read back so I don’t exactly know what happened, just glad she is okay, starting college is scary enough. And congrats on the new job! gaga—Ugh, so awful you had to go out in this cold for work. Stay safe. I’m looking forward to the Feb. actives as well. The ‘news’ page on the eStore with all the upcoming items made me drool! cwc—What a wonderful dream day!!!! Brrr….I’m cold and I don’t even live in the Polar Kotex zone! I would never make it in an extremely cold climate. Two cupcakes short! LOL! I’m probably more than that, but I haven’t evaluated yet. February seems quite busy in WW. I have trouble keeping up with it all. My dd helped me with the checkers game since it is NOT my favorite. Got my trophy today and so did she! Chant – Sorry about your hubby! Hope he is feeling better soon! ER visits are not fun! My dad went to the ER yesterday, but it turned out to not be anything serious. In our area the ER is call ED. What/???? I thought that stood for something else……But Emergency Department it is….. I doubt if I need more bake sale items…. Not sure I have even made the combinations. 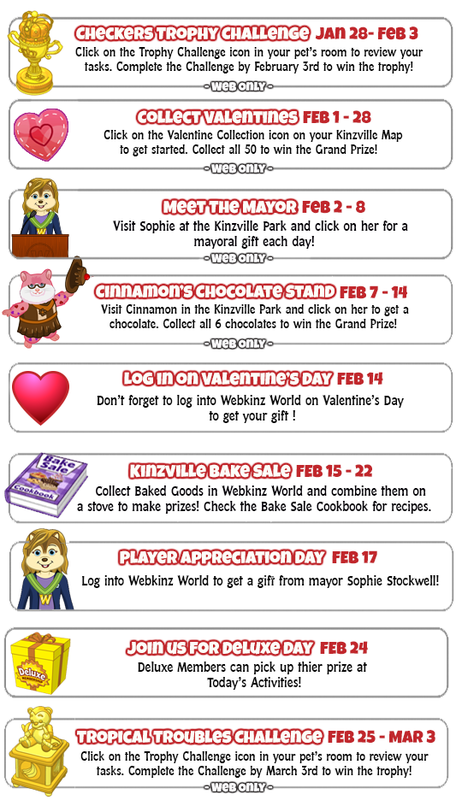 I know that I made one Kinzville Academy Cafeteria with one of the Bake Sales. Am I the only one that has trouble keeping up? Hey, Mist! You’re in luck, because I’ve been playing Smoothie Moves on the mobile app for a while now and have gotten really good at it You have mail! Nothing needed in return. Hugs! And thanks for the new post, moms! I’m especially looking forward to this year’s Valentine Collection – the Sweetheart Plushy is absolutely adorable! Ruby, your story terrified me. (((hugs)))double(((hugs))) for your daughter, and maybe can she do distance learning for a short term so she’s not anywhere near that thug? Also tell her to delete her social media so this animal can’t use it to further stalk her, and tell her to get a new phone number and not give it out to anyone. It might seem like an unnecessary upheaval in her life, on top of everything else, but she will be safer. Thanks all for the Rescue Team Certificate code. I’ve been so busy catching up on things I didn’t get done last month that I missed the scavenger hunt entirely lol. Oh, speaking of last month, I managed to get everything except the Snowman Hat that was the estore gift for Christmas. Anyone have a spare code for that? If so, let me know what you’re looking for in return. Thanks! Never mind, Mist, Cheese was busy while I was typing all that! Hey, Loop! LOL, I noticed that too! On my device, some levels would go really fast, and others would go at a snail’s pace – not sure if this is a technical oversight or just a way to drive everyone playing it nuts And I have a Sweet Snowman Hat for you! I’ve forwarded the code to moms Nothing needed in return, it’s just my way of saying thank you for everything you do for us ♥ Hugs! Brr it’s cold today. .weird weather, period! It was like some one just grabbed a powdered sugar shaker, and lightly covered everything, then put it in the freezer. I thought we were gonna get slammed it came down fast and hard. Then just stopped. . In all my years on thus earth, this is the strangest winter ever.. Tropical troubles??? Oh noooooo! Please not the next challenge! I really truly dislike that game..ugh! is anyone eating special things this weekend with the superbowl? i do not know who is playing, but we like superbowl food! Happy Thursday! Looks like January is over, and I hate to say it, but I am also 2 cupcakes short. I am missing Best Strawberry Apple and Friends Strawberry Apple, and hoping to trade (or shamelessly beg) for them! Anyone have any extras? No idea how I can have 8 of one, and none of another. Thanks for the checkers game, Chant! I didn’t know you could win by timing out … ! Assuming that’s what you were after! Good to know. I finished my trophy already, but if you need a few games, you can win the rest! Im done on this account if you need more I need a few on my enchantedisle2 I can add you there too! That was one flavor I didn’t have either sorry..
And thank you very much appreciate it big time as my computer seems to be very slow tiday! Ugh! Cupcakes go to Feb 14th. So no worries if you are still missing some. I made a spread sheet to keep track of what I have so far and doesn’t look like they had given out Strawberry in Friends yet or they did it the one day I missed. But given the patterns they have done so far don’t think so. Just checked newz Strawberry apple cupcake is today. Happy Friday! Thanks, tmt, I noticed when I got up this morning, they were still flying. Guess that’s why I didn’t have it yet! Sorry, Chant, I didn’t see your last message. I’m usually not on in the evenings, but I popped on last night to catch a few things I missed earlier. I accepted your friend request this morning, but hoping you didn’t miss that last trophy! Long, long day ahead … but hopefully, fun. We’ll see! Happy Friday to you too Miracle and everyone ! Hope all of you who have been in the deep freeze are getting warmed up !! April… Have you guys warmed up yet ?? How is Stella ? dee… haven’t yet planned Super Bowl Sunday menu yet but I am hearing that the group wants some kind of chicken entree….?? Breaded chicken ? Have to think about it… Any suggestions?? moms… Happy that you had a fun day yesterday ! Weather sounds great ! Hope you all have a great day…. Off to get my hair colored and cut !! Thanks for the code, Dee. Don’t know what food we are preparing for super bowl party. My husband usually does it. We go to a party hosted by friends and just bring along a finger food item to share. We may buy cheese sticks to put in their oven. Not sure. I did manage to get some extra checkers trophies if anyone needs one. It was pure agony, but…..it is done. I don’t mind the troubles game as much as some of you. Aren’t there two troubles? One I like better than the other. Oh, just checked. One is Bananza and the other is Tropical Troubles. I guess just one trouble game. LOL. gaga – maybe you should do a buffalo chicken something??? ED … didn’t Bob Dole or someone do a commercial for that??? Hi friends! Thank you for the code, Dee! WebkinzRUs – Thank you SO much for the lovely gifts! I didn’t have any of them, so they are greatly appreciated! I love them! April – Stella is so perfectly precious! I hope you all are keeping warm! Chant – I hope your husband is feeling better day by day. I hope you are too! End of my second week of work at my new job, and I can’t even tell you how much I love it. This place is amazing! I finished orientation today. I start on my own on Monday. So happy! I have learned so much these past two weeks. What an education! This is one great thing about the nursing profession. There are SO many directions to go. I would have never seen myself working in this position 10 years ago, but I’m so glad my path has led me here. I feel more at home in this place than I ever have in a job. I actually like going to work, for the first time ever. We are at a complete stand still with our drywall disaster. The co-owner was supposed to call us on Tuesday to discuss how to proceed from here. We have not heard from him. I’ve called him twice and left messages. No return call. I’m going to call him one more time tomorrow and let him know that if we don’t hear from him by the end of the weekend with a solid plan in place to repair the disaster they left in our house, we’re moving forward with a lawsuit. Chant – We live in Kentucky, so nowhere near CT. But thanks for the offer! My husband was a drywall hanger and finisher for 8 years in a past professional life. He was a master at his craft, and ran his own construction company for a few years before going to college and changing career directions. He and I hung and finished one room in our house a few years ago, and it’s perfect. He says that paint will not hide a bad drywall finish; it will magnify every flaw, especially when the light hits it. We have the skills to finish the drywall ourselves. We just don’t have the time. That’s why we decided to hire a company to do it for us. And we were very selective about the company we chose. They have a 5 star rating on Home Adviser and an A+ rating on the BBB (not for long). We told them up front that my husband is a former drywall hanger/finisher, and we showed them the room we completed ourselves so they had an idea of what our expectations were before they ever got started. These people can’t hang or finish drywall for anything, but they could sell an angora coat to a vegan in Florida in July. Thank you for all the hugs, prayers, kind thoughts and supportive words for my daughter. I mentioned your feedback and it put a big smile on her face. TLL – I totally get where you’re coming from with regard to distance learning, deleting her social media accounts, and changing her phone number. When this first happened, she said, “Mom, I can’t handle seeing him in psychology class again. I want to drop the class.” And my initial thought was, “Of course you can drop the class! You shouldn’t have to see him again.” But then I got to thinking, why should she have to drop her class? She did absolutely nothing wrong here. And the more I started reading about Title IX, I realized that that’s the intent behind it. A woman should have every bit as much right to go to school and gain an education in a safe environment as a man. She should not experience harassment or fear for her safety, at school or online. I’m so glad we reported this incident right away, not only so the police could investigate it, but because she and I have learned so much from this. Fortunately, her school has taken all of this SO seriously. The Title IX investigation was complete today, so we will probably be informed of a hearing within the next couple weeks. Additionally, because he contacted her through social media, and she reported that, the detective sent the case to the district attorney’s office. It was up to the prosecutor’s office (this is my understanding) that if they felt they had enough evidence to pursue a case against him, they would take it before a judge. It went before a judge last week, and we were informed early this week that the young man has been summoned to appear in court for a hearing. The detective believes he will have to decide between a plea or a possible trial. The day this happened, the detective told my daughter that she would not have to see him again, that he would be pulled from the class, not her. And that evening he was dropped from the class. A couple times, my daughter has said that she doesn’t feel like she can go back to this school, to the area where she was attacked, and that she just wants to go back to high school. I’ve told her that I fully support her decision no matter what she chooses. And we’ve explored her options. She can go back to high school if she wants. She can opt for distance courses if she wants and still get college credit for them. She can delete her social media accounts and change her phone number if she wants, but she doesn’t want to. And she shouldn’t have to. At the end of the day, the reason she is attending this university right now is because she wants to. It’s not because I make her go. It’s not because anyone tells her she should go. We’ve just told her that she can go if she wants to, and that we know she can succeed because she is so incredibly bright. So instead of opting out of school or social media or changing her number, she has decided to speak out about her experience. She has been actively involved with the violence prevention department and has scheduled counseling appointments. She has met with all of her professors to discuss the situation, and they are all working with her to get her caught up. Everyone at the school has been amazing, 100% supportive of her. Additionally, she has found a couple groups at the school that she really likes and has been getting involved in. Instead of retreating out of fear, she has found her voice and has learned to stand up for herself. What this guy took from her was a feeling of security and innocence. What she is taking back is a feeling of power and ownership over her environment. He hurt her, but his actions are bringing detrimental consequences to himself. And to some extent, his fate now lies in her hands, which gives her a feeling of power. A few years ago, I got really into slam poetry. For a couple years, I competed locally, won local, state, and regional competitions, and even had the opportunity to compete in an international competition in Washington D.C. My daughter accompanied me to many of those competitions, including the international one. She dabbled with writing and even performed a few of her own poems at the time, but she was only 13, so her stuff was a bit young for most of the audiences. Everyone thought she was cute, but nobody took her seriously. Except for her Haikus. She actually won a Haiku Slam at age 12 against 5 adults, one of whom was the reigning Haiku champion in Dayton, Ohio. Her trophy was a free hot chocolate on the house (since she didn’t like coffee). One of the university groups that she has been getting involved in is hosting an open mic in April. The other night, she and I were talking about all of this stuff that has happened and started brainstorming some poetry ideas. She walked out of the room, came back half an hour later and was like, let me read this to you. …… OMG. This dude messed with the wrong girl. Somewhere, a brilliant slam poet was buried inside her, and she has arisen. She wrote a poem about her experience, and when she read it to me, it was with so much anger and passion and conviction, I just sat there and wept. I knew this experience had upset her, but she has a constitution like stone. If she cracks, it’s from the inside out, and you won’t even know something is bothering her until she completely falls apart. But she didn’t fall apart. She spit that poem with total conviction, and for the first time, I really felt what she was going through. And she said, “Mom, I will not let this **** define my college experience. I’m not in college because anyone is making me go. I’m here because it’s what I wanted. And it’s still what I want.” She has made other friends on social media besides this jerk, and she shouldn’t have to give up those friendships. Every time he has made her feel uncomfortable or unsafe, she has turned the tables on him. He is the one being summoned to appear in court for a felony. He is the one facing permanent damage to his reputation, his academic record, his criminal record, and who will possibly have to register as a … not sure if I can say it on here but you can read between the lines… she was underage and it was an assault of a certain nature. This may follow him for decades, and rightfully it should. Who is in the position of power now? She is owning her own number, staying friends with others in the social media group who have strongly supported her through this. She is staying on campus, her university campus, and holding her head high wherever she goes. Although, she vows that she will never go back to that location again. She starts to have an anxiety attack whenever she walks past the building. But that’s ok, because there are plenty of other places for her to eat and hang out when she is there, places where she feels perfectly safe. And she has made a few new awesome female friends on campus and is participating in a couple groups. She is planning to perform her poem for one of the groups on the open mic in April. And to prepare for that, we are planning to go to a fun slam venue up in Dayton, OH this weekend so that she can practice for a live audience in advance. There is nothing I want more than to reach out and protect this child at all costs. If I could take every pain and sadness and thought that she has of harming herself away from her, I would. But I learned years ago that I can’t. I can only offer her my guidance, love and support. And really, that’s all she needs. She has such a good head on her shoulders. She makes better choices than most adults I know. While it might make me feel a bit better to pull her home, encourage her to do distance classes, ban all social media and change her number, she would feel like she was being punished. And if ever there was a kid who doesn’t deserve to be punished, it’s her. She doesn’t need external motivation. She has such strong internal motivation. She doesn’t need me to take control. She’s doing just fine on her own. She just needs me to be there for her, to love and encourage and support her. So we’re getting through it one day at a time. She’s doing better each passing day. She is now caught up on her school work, which is a huge relief to her. I will spend a good part of tomorrow watching “boring” biology videos with her, which makes her feel like I’m helping her with her school work. Your warm thoughts and prayers of support and encouragement have been greatly appreciated! Hugs to all of you! RubyCubes.. So happy to hear that you have found your dream job ! You deserve it !! Sounds like you have raised a strong independent young woman… despite her young age.. Inspirational that she is standing up for herself and not intimidated by the creep ! She is so lucky to have you to love and support her decisions… YOU GO GIRLS !! Thinking of you during the struggles and sending a Hug back to you ! dee.. thanks for posting the new codes.. Sure does make things easier ! Weather here still in the teens … but promises to warm up to 40’s today ! How is everyone else ‘s weather ??? April .. are you out of the deep freeze yet ?? How is the adorable Stella ?? Finished second checkers trophy… I’m done… On to Tile Towers !! I really like that game ! Getting ready to head out… Busy morning.. Today is my morning to volunteer at the hospital… then a short list of errands to get ready for the Super Bowl gathering tomorrow ! My nephew’s Ram jersey arrived last yesterday… relieved that I don’t have to go out today and get another one ! Hope you all have a great Saturday ! Enjoy the heat wave ! Opened the door yesterday morning to let Stella out…ahhh, what a relief, felt kind of warm in a way. It was 0 degrees. LOL! Today it’s 30 and feels like spring, except for the snow on the ground. We have officially thawed out. gaga—Stella is awesome! She’s growing everyday and so stinking cute. She started her puppy class last week. The first part they all play and then we do a few activities. It’s a precursor to a formal obedience class. She catches on to things pretty quickly. She’s also really ‘talkative’ lots of grunts and squeaks while playing. We love her to pieces. Have fun tomorrow with the family! Ruby—I just read back and found out what happened to your dd. I have no words…but then I have a lot of words. What an amazing young woman. And you are amazing as well. You are allowing her to deal with this trauma and make her own choices (as hard as I’m sure that is) in a safe loving environment. I’m so thankful the school took this seriously and has been with her 100%. Standing up and not letting this creep get away with this is probably saving so many other girls. This will not define her, it will make her stronger. Prayers and hugs to you both. So happy to hear the new job is amazing and you love it. I hope you can get that co-owner to fix the mess they made. It’s awful to have to deal with that on top of everything else. I big thank you to whoever posted about timing out in the checkers game! Save me so much time in getting the trophy. I know we are doing guacamole and potato skins for Sunday. Haven’t figured out the rest. I think we might do that dip in the crock-pot…sausage/ground beef and velveeta. Feeling old school this year. Hope everyone is warmed up and have fun tomorrow! Ruby – Thanks for update on your daughter! She sounds amazing! April – Glad that Stella can enjoy “warmer” weather today of 30 degrees! Ha ha! Yeah, that timing out on checkers helped me once I realized it! Thanks for the code, Muffin! i have to catch up – not a ton of time!